Ok, kids, here's the last installment of this fun scrapbook! I had scheduled a second class for this scrapbook for December 19th - but it has already filled! Are there enough of you out there for me to find time for a THIRD class?!! Let me know, ok? So, as you are reading this, we are headed north for our second skating competition this season. We'll be in Stamford, Connecticut this weekend for the Terry Conners Synchro Classic. But today - we are spending the day in NYC!!! We have tickets to see the Radio City Music Hall Christmas Spectacular and we'll be eating in a couple of our favorite restaurants too. I'm looking forward to seeing the tree at Rock Center and checking out the Christmas window displays and decorations. Love NYC! I'm sure I'll have photos on Facebook from today and from the skating too. I know some of you follow Emma's skating, so I'll try and get a video up of their performance as soon as I can. Now, how about some scrapbook pages? 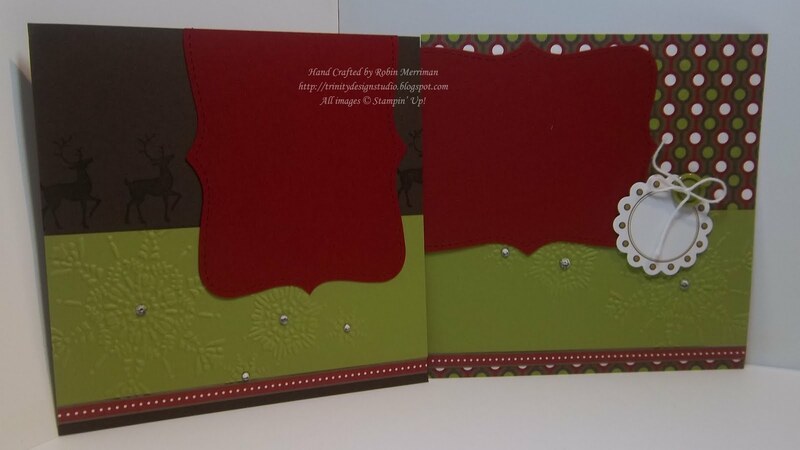 I stamped the background with the swirl from Season of Joy and added a bit of glitter to the berries on the holly Sticky Die Cuts. I love this page! Two die cut Scalloped Square tags (from the duo die) Hey, you either duo or die! Get it?! Ha! I crack myself up! Anyway, Sticky Die Cuts used for the reinforcements and threaded with Cherry Cobbler Baker's Twine. The tags fit down in the white cardstock pocket. Ok, THESE are my two favorite pages in the whole album! I got the idea for the Santa's list from SU! demo Ashley Marostica and just altered the design to suit my style. 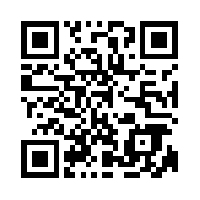 Even if you don't have a "letter for Santa", this would be a great place to journal about your holiday! 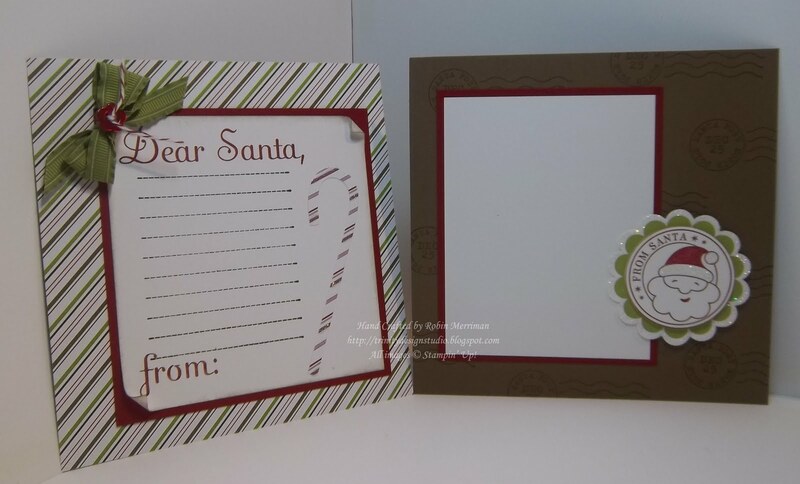 The Santa medallion on the second page is popped up on Stampin' Dimensionals so the photo will slide under it. The cute rik-rak Sticky Die Cuts frame out this photo mat nicely and leave a space for journaling too. The little Sticky Die Cut tag was nullified with more baby powder and added to the ribbon with a Mini Glue Dot. Nothing fancy here, just a nice space for two photos! Almost done! The Big Shot makes these pages easy. 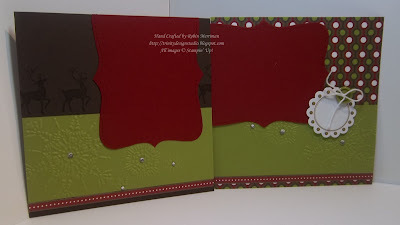 Northern Flurry embossing on the Lucky Limeade cardstock panels and two Cherry Cobbler Top Notes for photos. A little bling, a button and some twine finish it off. Last one! Two tags for photos, journaling or both, each in it's own little pocket. 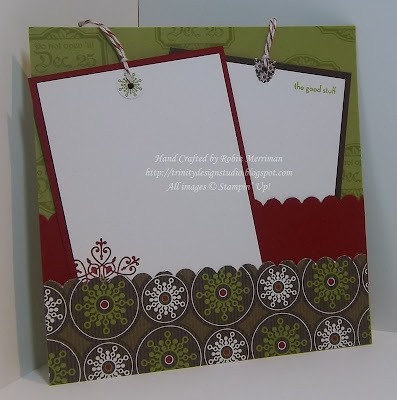 I used the greeting from Notes and Details for the one tag corner. So, there you go, all done!! I'll post the photos of the four cards we made tomorrow for you, ok? 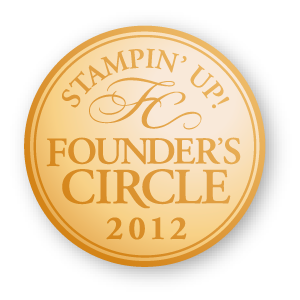 In the meantime, if you need to shop for stampin' supplies, stop by my Online Store! 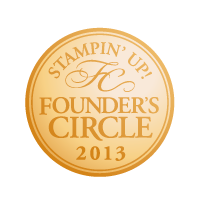 With my NEW Rewards Program, you earn points towards FREE Stampin' Up! 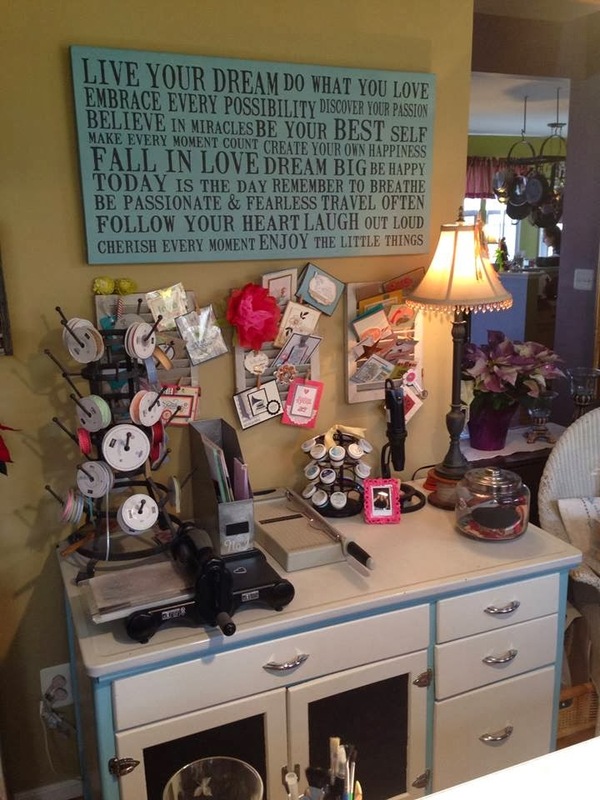 products each time you shop there! 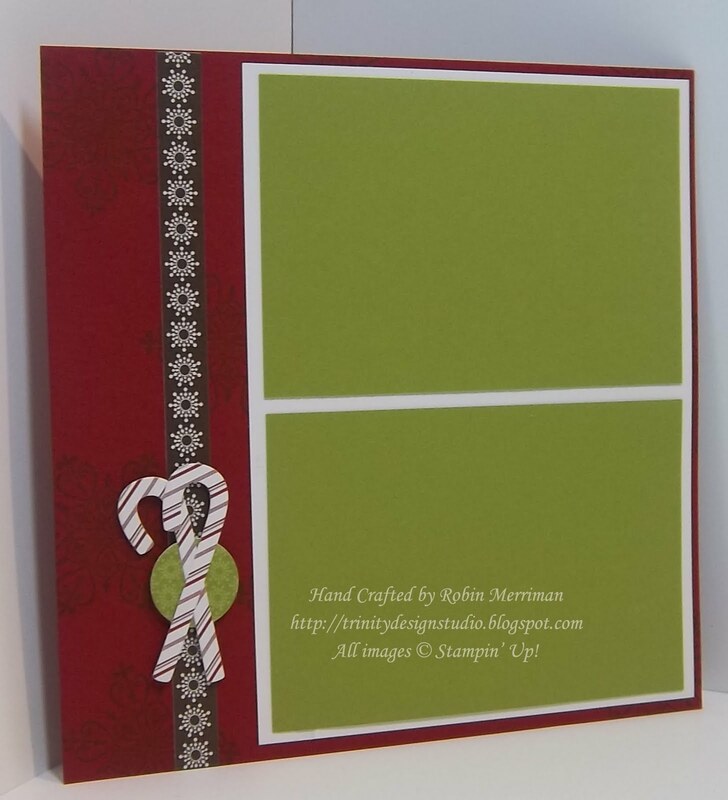 LOVE your 6x6 scrapbook! I am doing a 6x6 December Daily scrapbook this year and got lots of ideas from your posts. 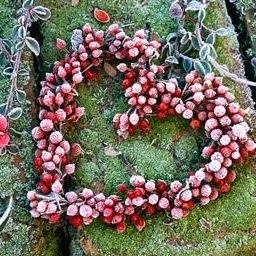 I will be using Holly Berry Bouquet DSP for mine (over ordered for another project in a panic order!). Do you mind sharing how much you charged for your class? I know about what your product cost was, but it looks like a lot of designing/prepping for this project! Thanks for sharing your wonderful project!